Without former coach Jason Peters and wrestler Mikey Racciato, the Pitt wrestling program attempted to recover, if only briefly, from a tumultuous week. The weekend started poorly for the No. 23 Panthers (8-3 overall, 0-1 ACC) as they took a beating Friday in Blacksburg, Virginia, losing to No. 5 Virginia Tech (12-1 overall, 2-0 ACC) 38-9 in their first ACC competition of the season. The team bounced back the next day with a convincing 37-6 win over Virginia Military Institute (1-9 overall) in Lexington, Va. to go 1-1 over the weekend. Acting Athletic Director Randy Juhl dismissed former head coach Jason Peters Thursday of last week over an incident in Evanston, Illinois, involving at least three of the team’s wrestlers. The Evanston Police Department responded to a call at approximately 2:30 a.m. on Dec. 31 from someone inside the wrestlers’ hotel room. One of the men who answered the door said three women, whom they’d met on the internet, had stolen money. Pitt Athletics has refused to confirm whether Racciato, or any other members of the team, are suspended, but the 149-pound senior has not wrestled since the Midlands Tournament. Pitt has also not explained Peters’ role in the incident he was let go as the University conducts an investigation into the matter. It’s unlikely that Racciato could have pulled the Panthers out of the hole against the Hokies’ experienced roster Friday. VT boasts five ranked wrestlers who dominated from start to finish. The Panthers managed to win just two matches on the day, with neither coming against ranked opponents. Still, acting co-head coach Drew Headlee said he was satisfied with what he saw. “I was happy with the way we went out and battled with one of the top teams in the country on the road,” Headlee said Friday in a press release. 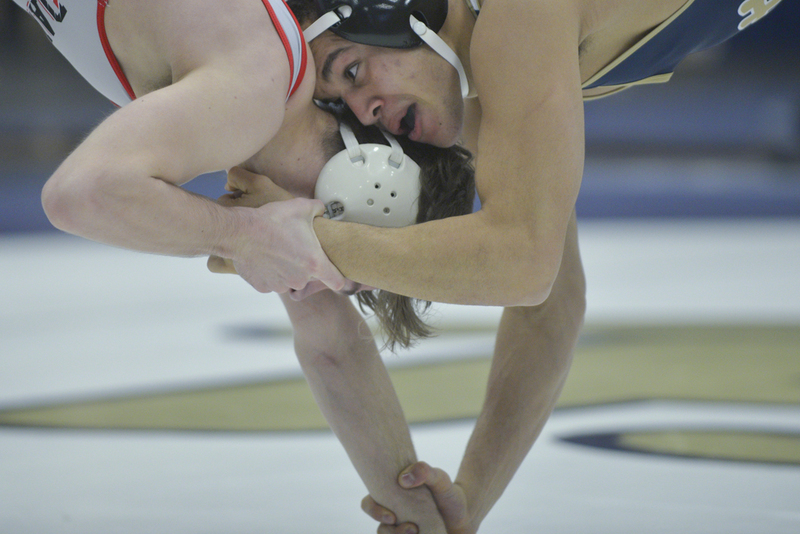 Pulling the upset was tough for Pitt from the beginning, as the team forfeited both the 125-pound and 133-pound contests. Before any wrestler had taken the mat, the Hokies already had a 12-0 lead. The Panthers got off to a promising start as 141-pound sophomore Robert Lee dominated VT’s Brendan Ryan in the team’s first bout of the day, winning by a 13-1 major decision. In the 149-pound weight class, redshirt freshman Alex Murray filled in for Racciato, who has now missed his second consecutive meet. Hokies junior Mattheos Lozier took advantage of his inexperienced foe, outscoring Murray via a 10-6 decision. The Hokies stretched their lead in the next match by 17-1 after a technical fall by No. 16 157-pounder Sal Mastriani. Mastriani dismantled Pitt’s Nathan Russell, and the match was called with one second left in the first period. Midway through the dual meet, VT had taken a commanding 20-4 lead. The Panthers responded in the 165-pound bout, as No. 12 TeShan Campbell rolled over VT wrestler David Bergida, recording his own 17-1 technical fall and closing the gap to 20-9. The win moved Campbell’s record to 12-2 on the year and 9-1 in dual meet competition. But the Hokies put a quick stop to Pitt’s momentum, as first-year Panther Christian Dietrich couldn’t keep up with No. 2 174-pounder Zach Epperly. Dietrich kept the score close against his heavily favored opponent into the third period, but the task proved difficult, as Epperly pinned Deitrich with less than 30 seconds left in the match, extending VT’s lead to 26-9. VT’s highly ranking roster closed out the match from there, as No. 4 Zach Zavatsky easily dispatched Pitt sophomore Mat Carr for a 21-6 technical fall victory. No. 3-ranked wrestlers Jared Haught and Ty Walz then defeated Panthers John Rizzo and Ryan Solomon at 197 and 285 pounds, respectively. The Hokies went on to win the match by a final of 38-9. Just a day after suffering the lopsided loss at Virginia Tech, Pitt came back Saturday afternoon, defeating VMI in a dominating fashion, 37-6. The Panthers’ determined effort began in the first match of the day, with the 125-pound weight division. Pitt’s LJ Bentley came through against VMI’s Dalton Henderson, scoring a two-point takedown in the first round and holding on to win a low-scoring 2-1 decision. But for the second match in a row, Pitt was forced to forfeit the 133-pound match due to the absence of No. 8 Dom Forys, giving the Keydets a 6-3 lead heading into the 141-pound contest. The lead didn’t last very long, as Lee quickly put his team back on top by pinning VMI’s John Reed at just 1:07 into the match for his second win of the weekend. Pitt carried its momentum into the next match, as Murray defeated VMI’s Stevan Smith by an 11-4 decision, putting the Panthers up 12-6. Pitt picked up another victory in the 157-pound weight class, as Pitt redshirt freshman Taleb Rahmani completely outclassed Keydet Dolan Walsh. The outcome was never in doubt as Rahmani picked up a 19-1 technical fall victory. In the 165-pound contest, Campbell scored a 21-6 technical fall against VMI’s Cade Kiely, his second win by technical fall of the weekend. The 174-pound bout was a relatively tight one, with Keydet Shabaka Johns making a late comeback attempt against Dietrich. Dietrich was able to survive, winning a 7-3 decision to make it 25-6 and clinch victory for Pitt in the dual meet. From there, Panther sophomore Donovan McAfee and Rizzo won decisions at 184 and 197 pounds, respectively, before Solomon closed the meet with a first-period fall at 285 to finalize Pitt’s 37-6 victory. The Panthers have a week off before returning home to take on conference foe North Carolina at the Fitzgerald Field House at 7 p.m. Jan. 28.